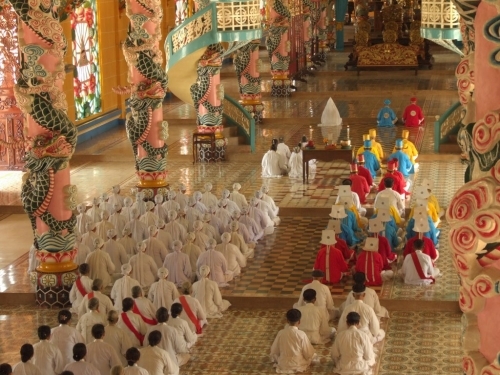 Cao Dai temple: combination of several religions and decorated colors. 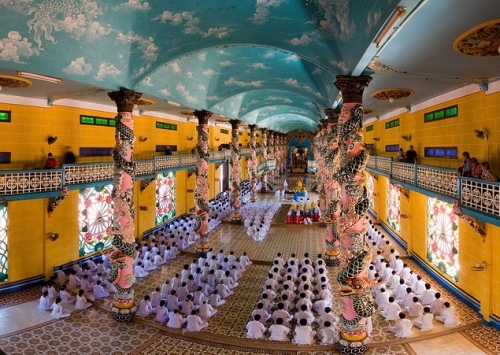 What is Cao Dai Temple? How many religions there? What will they do there at midday? Please try and discover this tour. 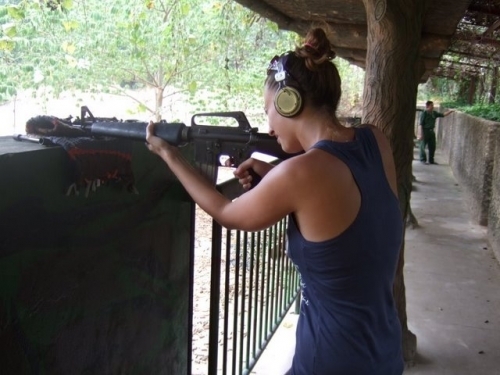 Once in Vietnam, you must visit Cu Chi tunnels. You’ll have a chance to crawl around a portion of the 121 km long, multiple-layered tunnels. Learn how thousands of guerillas managed to stay underground many days at a time, also their great technique to conceal smoke from their cooking. Morning Tour is Cao Dai Temple in Tay Ninh. 07.30am Pick you up at our office. You will start from Ho Chi Minh City/Saigon to Cao Dai Temple in Tay Ninh - a province 95 kms South East of HCMC, close to Cambodia border. The Cao Dai Temple is like a Walt Disney fantasia of the East. Its exterior is decorated with multi-colored dragons of all shapes and sizes competing for space with a number of swastikas. Above the main entrance is the all-seeing holy eye, the symbol of the Cao Dai sect. The interior is just as engaging as statues of Jesus Christ, Buddha and the Hindu god, Brahma, stand side by side. Cao Dai Temple is the eclectic mix of colours and the amazing use of architecture create a space of beauty, spirituality with a somewhat surreal flavour to western palates! For the midday service which was unbelievable in Cao Dai Temple - do not miss this! 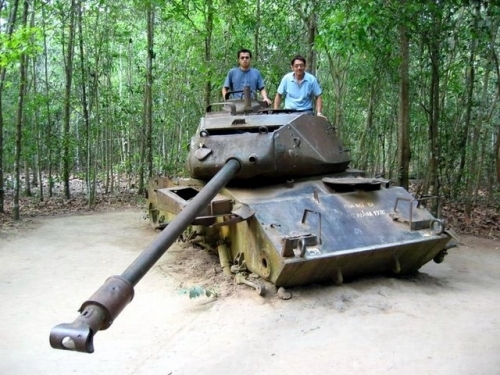 Afternoon tour is Cu Chi Tunnel Tour. Finish Cao Dai Temple - Cu Chi Tunnels 1 Day Tour. Arriving Saigon/Ho Chi Minh City at 06.00pm - 07.00pm. Clients transit Tan San Nhat airport, you can take this trip with a private tour. Please add pick-up airport fee. Pick-up airport fee is applied for per car/van (Maximum 2 pax in Car - 4 seats, Maximum 4 pax in Van - 7 seats, Maximum 10 pax in Van - 16 seats, Maximum 20 pax in Van - 30 seats). Special request (diet or vegetarian, …) should be noticed before your departure date. Standard Type: Air con tourist bus, English speaking tour guide, entrance fee and 01 Aquafina water bottle/pax. Deluxe Type: Air con tourist bus, English speaking tour guide, 01 lunch, entrance fee and 01 Aquafina water bottle/pax. Private transport (pick-up and drop off at your hotel), English speaking tour guide, Vietnamese lunch, entrance fee and 01 Aquafina water bottle/pax. Gun shooting, tips, drinks, travel insurance and personal expenses. Saigon at hotel in District 1: Drop off hotel in Dist 1 at address mentioned in "meeting point"
Gun shooting, tips, drinks, travel insurance and personnel expenses. Print your voucher; locate the voucher in your travel confirmation e-mail or in "show ticket" link on the site and show voucher to guide. Please provide name of hotel and hotel address in Dist 1, HCMC, Vietnam where we can be free pick-up. If your hotel's location is on these streets such as De Tham St, Bui Vien St, Pham Ngu Lao St, Le Lai St, Le Thanh Ton St, Bui Thi Xuan St, Pham Hong Thai St, Thu Khoa Huan, Nguyen An Ninh St, Cong Quynh St, Ly Tu Trong St…Dist 1, HCMC, Vietnam, we will free pick-up from your hotel at 07.30 - 08.00am (please provide your hotel address and the name of hotel where you will stay at). Mentioned addresses exclusion, please come to Viet Fun Travel Office (28/13 Bui Vien St, Pham Ngu Lao Ward, District 1, HCMC) at 07.30 am. We will free pick-up and drop off at hotel in Saigon/Ho Chi Minh City. For customers who have registered to use our services, please Login to post your comments. © 2010 - 2017 © Viet Fun Travel. All rights reserved.